The idea came to Mariah Wills while she was working at a local Starbucks. One of her regular customers, Glen Friedman, was a member of the West Linn Sustainability Advisory Board and often talked to Wills about projects. A passionate advocate for solar energy who has led workshops on it in both West Linn and Lake Oswego, Friedman told Wills that the SAB hoped to do an evaluation of the city's parks and community centers — quantifying their energy usage and determining the feasibility of a large scale solar overhaul. Wills, who was entering her senior year as a renewable energy engineering major at the Oregon Institute of Technology in Wilsonville, realized she'd found a perfect senior project. "I thought, 'I want to do this myself,'" she said. "It was local, right? That was kind of fun. And it was really everything we do in class." Wills teamed up with her classmate, Christopher Crockett, to start the project in the summer of 2017, and the pair quickly doubled to include Abdulaziz "Zee" Alkhattab and Austin Tanzer once the students realized the scope of what they hoped to accomplish. Over the next 10 months, the group would evaluate the energy usage and subsequent carbon emissions generated at all West Linn parks that consume electricity, as well as four community centers: the McLean House, Sunset Fire Hall, Adult Community Center and Robinwood Station. The students' goal was to determine the feasibility of making the parks and community centers "electrically net zero" — meaning they'd produce as much electrical energy as they consume on an annual basis. 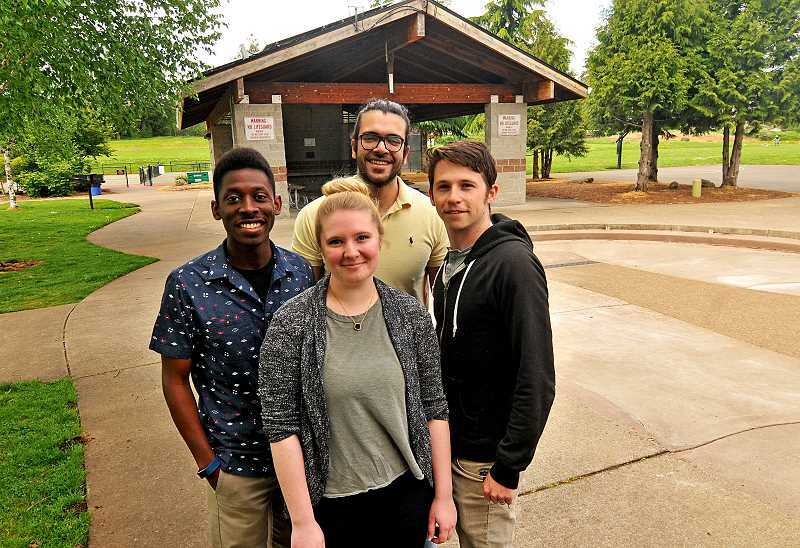 They dubbed it "The Green Zero Project," and in a presentation to the West Linn City Council and SAB May 7 the students made a final recommendation with the same name. The "Green Zero Design" calls for the installation of 500 solar panels across the city at an estimated cost of $704,000, which — along with short-term measures like updating to LED lighting and using hybrid electric water heaters — could decrease carbon emissions from parks and community centers by more than 16 percent. Such a cut would be significant, as electricity ranks second behind natural gas among contributors to the 387 metric tons of carbon dioxide emitted every year from West Linn parks and community centers. "We suggest additional studies be done specifically looking at the natural gas usage — so heating buildings, water heaters — as well as maintenance vehicle emissions," Wills said during the presentation. The group worked closely with both the SAB and the Parks and Recreation Department through what proved to be an exhaustive research process. "We started with energy bills — inspecting all of those," Alkhattab said. "And then we did walk-in inspection assessments for each of the sites." At the parks, that meant battling the winter elements while taking inventory of both the natural elements — to determine if solar panels were feasible — and pieces of equipment like thermostats and water heaters. "Honestly, we did it at the right time, even though it sucked when we were doing it," Crockett said. "We did it while it was cold and raining, so we saw (the parks system) during its heating season." The community centers presented their own challenges, but the students were relieved to find plenty of willing collaborators. "The community centers had more people we could talk to, and gather information that way," Tanzer said. "(At the Adult Community Center) they brought out architectural drawings and everything for us." Some of the group's findings were unexpected. "The parks were surprising — how much energy they were using," Wills said. "And when they were using it, too," Tanzer added. "We were expecting in the summertime they would be using a lot more power, because there's a lot more people using (the parks), but in the wintertime, because they have to run heaters to keep all the pipes warm, the power was twice as much." While it didn't make any firm commitments, the City Council was generally receptive to the group's ideas. Mayor Russ Axelrod said that while the City's general goal is to cut carbon emissions by 80 percent by 2040, he'd like to see that timeline moved up. "We can do much better than that," he said. Axelrod also asked about energy usage at City Hall, but the students said their research was strictly limited to parks and community centers. Parks and Recreation Director Ken Worcester added, however, that the Energy Trust of Oregon is completing an audit of both City Hall and the West Linn Public Library. City Councilor Rich Sakelik asked about a projected break-even point if the City did invest the $704,000, which the students estimated to be about 20 years down the line. They added that the life expectancy for solars panels was about 25 years. "And in 25 years, chances are that we have a different technology, the way our country goes," Sakelik said. Moving forward, the students hope that others will carry their renewable torch after they graduate. "We have a senior symposium coming up, and we'll show the project at that," Wills said. "We'll be plugging more work that can be done for the City." "It definitely seemed like everybody was really receptive to our ideas, and kind of excited about the opportunity to go further with this project," Crockett said.